Sky+ app update lets you view smartphone photos on your TV | What Hi-Fi? An update to the Sky+ mobile app has now made it possible to view the photographs stored on your smartphone or your living room TV, without the need for wires or any other extra equipment. It's one of the features added to the Sky+ app as part of the latest update – all you need to do is connect your smartphone or tablet to the same wi-fi network as your existing Sky+ HD box. A camera icon will appear in the navigation bar of your app and, with a single click, you follow a few steps in order to see your images appear on your TV. Meanwhile, other new features include 'New and Recommended', letting you discover new and popular programmes; a shortcut to all the sports channels; and 'Smart Series Link' recording. Sky's Luke Bradley-Jones said: "The photo viewing function lets you simply, quickly and easily view photos on your TV via a connected Sky+HD box without the need for any extra devices. "The app will now mirror the new Sky+ Homepage, with great features like Smart Series Link and New & Recommended helping customers find the TV they really want to watch." 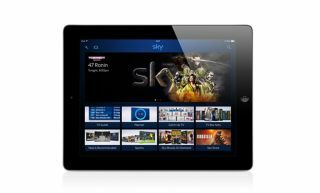 Sky has also confirmed the launch of a new version of its Sky+ app, which has been developed with RNIB to make it easier for customers with visual impairments to find their favourite shows. It is hoped this version of the app will make it easier to browse the Now and Next TV guide; find programmes with Catch Up TV; access movies in the Sky Store; and use Smart Series Link. David Meredith, Sky’s head of Core TV Products said: "We want all our customers to enjoy the same great Sky experience and so making accessibility a core part of the Sky+ app was extremely important to us."